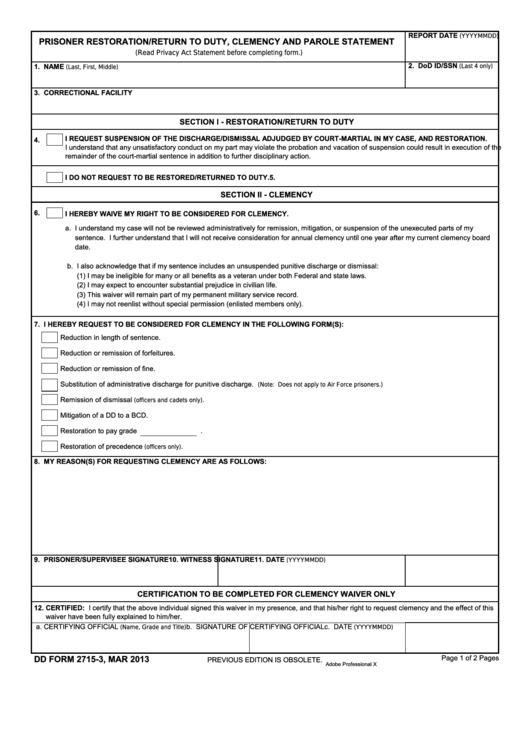 Download a blank fillable Dd Form 2715-3 - Prisoner Restoration/return To Duty, Clemency And Parole Statement in PDF format just by clicking the "DOWNLOAD PDF" button. Complete Dd Form 2715-3 - Prisoner Restoration/return To Duty, Clemency And Parole Statement with your personal data - all interactive fields are highlighted in places where you should type, access drop-down lists or select multiple-choice options. I REQUEST SUSPENSION OF THE DISCHARGE/DISMISSAL ADJUDGED BY COURT-MARTIAL IN MY CASE, AND RESTORATION. remainder of the court-martial sentence in addition to further disciplinary action. I DO NOT REQUEST TO BE RESTORED/RETURNED TO DUTY. I HEREBY WAIVE MY RIGHT TO BE CONSIDERED FOR CLEMENCY. (1) I may be ineligible for many or all benefits as a veteran under both Federal and state laws. (2) I may expect to encounter substantial prejudice in civilian life. (3) This waiver will remain part of my permanent military service record. (4) I may not reenlist without special permission (enlisted members only). Reduction in length of sentence. Reduction or remission of forfeitures. Reduction or remission of fine. Substitution of administrative discharge for punitive discharge. Mitigation of a DD to a BCD. waiver have been fully explained to him/her.